This is one of the famed "Pachmayr Combat Specials" that Mike LaRocca built for one of the customers of Pachmayr Gun Works. 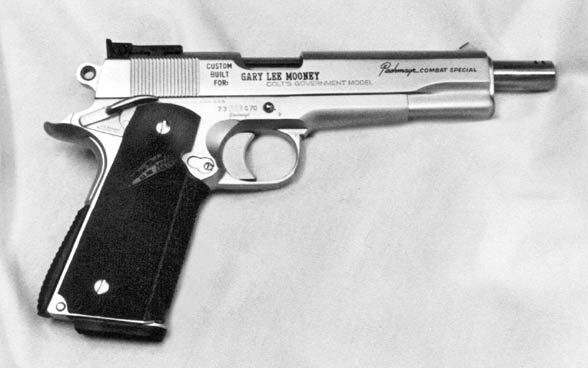 Using a Series 70 Colt Goverment Model and a six-inch BarSto barrel, it was not only rugged and reliable for the "action pistol" discipline of the day, but accurate enough to be shot in a bullseye match, as attested to by the accompanying target. Five rounds of factory Winchester "Super X" ammunition into a 0.100" X 0.200" group at 25 yards, machine rested, showed what a competent 'smith with a proven "blueprint" could do. This was typical of the work that the shop and Mike LaRocca routinely produced. The good news is that Mike is still performing the same high caliber of work ib his own LaRocca Gun Works in Worcester, Massachusetts. Got an original Pachmayr pistol and want to make sure it's in spec? Mike'll do that as well. Don't let your classic lose it's value from improper maintenance.